ok, just for the record, i was kidding about being angry. yes, Kennedy was the only Catholic. We've had actually had 4 Unitarian Presidents in the past, and I don't think one would have a chance today. 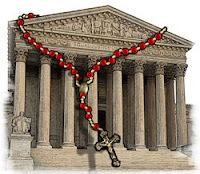 So, why does being Catholic increase your odds of the Supreme Court while being Protestant increases your chance of the big gig? Judging from this article (http://en.wikipedia.org/wiki/Religious_affiliations_of_United_States_Presidents#List_of_Presidential_religious_affiliations_.28by_religion.29) it looks like Episcopalian is the way to go.